The word may be described as the basic unit of language. It has meaning and form, it is composed of one or more morphemes, each consisting of one or more spoken sounds or their written representation. Morphemes are also meaningful units but they cannot be used independently, they are always parts of words. The combinations of morphemes within words are subject to certain linking conditions. When a derivational affix is added a new word is formed, thus, listen and listener are different words. Employing different grammatical functions words may take functional affixes: listen and listened are different forms of the same word. Different forms of the same word can be also built analytically with the help of auxiliaries. E.g. : The world should listen then as I am listening now (Shelley). When used in sentences together with other words they are syntactically organised. Their freedom of entering into syntactic constructions is limited by many factors, rules and constraints (e. g.: They told me this story but not *They spoke me this story). simplest word has many different aspects. It has a sound form because it is a certain arrangement of phonemes; it has its morphological structure, being also a certain arrangement of morphemes; when used in actual speech, it may occur in different word forms, different syntactic functions and signal various meanings. There are many authors who analysed definitions of a word (A. Rossetti, D.N. Shmelev, T. Hobbes, H. Sweet, by L. Bloomfield, E. Sapir) . Within the scope of linguistics the word has been defined syntactically, semantically, phonologically and by combining various approaches. The word has been syntactically defined for instance as “the minimum sentence” by H. Sweet and much later by L. Bloomfield as “a minimum free form”. E. Sapir takes into consideration the syntactic and semantic aspects. He calls the word “one of the smallest completely satisfying bits of isolated ‘meaning’, into which the sentence resolves itself”. Sapir also points out very important characteristic of the word, its indivisibility. The essence of indivisibility will be clear from a comparison of the article a and the prefix a- in a lion and alive. A lion is a word-group because we can separate its elements and insert other words between them: a living lion, a dead lion. Alive is a word: it is indivisible: nothing can be inserted between its elements. The morpheme a- is not free, is not a word. In these exaples certain groups of morphemes behave as ‘blocks’ — they occur always together, and in the same order relative to one another. There is no possibility of the sequence s - the - boy, ly - slow, ed - walk. “One of the characteristics of the word is that it tends to be internally stable (in terms of the order of the component morphemes), but positionally mobile (permutable with other words in the same sentence)”. The semantic-phonological approach may be illustrated by A.H.Gardiner’s definition: “A word is an articulate sound-symbol in its aspect of denoting something which is spoken about. The eminent French linguist A. Meillet (1866-1936) combines the semantic, phonological and grammatical criteria. He said that “A word is defined by the association of a particular meaning with a particular group of sounds capable of a particular grammatical employment. So, according to all those definitions, word is the smallest significant unit of a given language capable of functioning alone and characterised by positional mobility within a sentence, morphological uninterruptability and semantic integrity. The weak point of all the above definitions is that they do not establish the relationship between language and thought. There is also a word theory based upon the materialistic understanding of the relationship between word and thought on the one hand, and language and society, on the other hand. It has been discussed by such scholars as V.V. Vinogradov, A. I. Smirnitsky, O.S. Akhmanova, M.D. Stepanova, A.A. Ufimtseva. The word is a unity of form and content. Its content or meaning is not identical to notion, but it may reflect human notions. Concepts fixed in the meaning of words are formed as generalised and approximately correct reflections of reality, therefore in signifying them words reflect reality in their content. The sound aspect of the word serves to name objects of reality, not to reflect them. In this sense the word may be regarded as a sign. The word is connected with referent, the object, phenomena, quality, action, denoted by the word. We do not know much about the origin of language and of the origin of words. We know nothing – or almost nothing – about the mechanism by which a speaker’smental process is converted into sound groups called “word”, nor about the reverse process whereby a listeners brain converts the acoustic phenomena into concepts and idea, established a two-way process of communication. There are two main approaches to lexical meaning: referential and functional. The referential approach studies the connection between words and things or concepts they denote. Functional approach studies relations between words. reflected in human mind: “a feathered animal with wings“. The account of meaning given by Ferdinand de Saussure implies the definition of a word as a linguistic sign. He calls it ‘signifiant’ (signifier) and what it refers to — ‘signifie’ (that which is signified). By the latter term he understands not the phenomena of the real world but the ‘concept’ in the speaker’s and listener’s mind. The situation may be represented by a triangle (see Fig. 1). Arnold I.V. reproduces the model to show the main features of the referential approach in its present form. The scheme is given as it is applied to the naming of cats. The scheme is still over-simplified and several things are left out. It is very important, for instance, to remember that the word is represented by the left-hand side of the diagram — it is a sign comprising the name and the meaning, and these invariably evoke one another. So we have to assume that the word takes two apexes of the triangle and the line connecting them. In some versions of the triangle it is not the meaning but the concept that is placed in the apex. This reflects the approach to the problem as formulated by medieval grammarians; it remained traditional for many centuries. 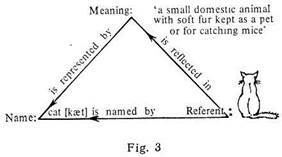 Meaning is closely connected with all parts of the semantic triangle but cannot be equated with any of them. Generally speaking, meaning can be described as a component of the word through which a concept is communicated, in this way endowing the word with the ability of denoting real objects, qualities, actions and absract notions. The functional approach assumes that the meaning of a linguistic unit can be studied only through its relation to other linguistic units and not through its relation to concept or referent, e.g. we know that the meaning of “black n“ and “to black v“ is different because they function in speech differently. Analysing various contexts in which these words are used we can observe that they have different distribution. As the distribution of the two words is different, their meanings are different too. The same is true of a polysemantic word: Look at me – You look tired. The branch of linguistics which specualises in the study of meaning is called semantics. Semantics studies the difference or sameness of meaning. non-conceptual parts: kid, gorgeous, birdie. 3. The number of concepts does not correspond to the number of words and meanings. One concept may be expressed by several synonymous words: child, kid – infant. One polysemantic word may express several concepts: draw – “move by pulling“ (draw a boat out of the water), “obtain from a source“ (draw water from a well), “make with a pen, pencil or chalk“ (draw a straight line). Some words do not express concepts at all: well, must, perhaps. 4. Concepts are mostly international. Meanings are nationally specific. Words expressing identical concepts may have different meanings and different semantic structures in different languages: house – дом; blue - синий, голубой. Cambridge English Language Assessment. | IV. The shooting of guns, etc. ; e. g. to open (cease) fire.